Wooden shoulder yokes were used to carry two buckets of milk from the cow to the dairy in the days when cows were milked in the fields. They were also used by milk sellers to deliver fresh milk to shops and to households, a common site in the 18th and 19th centuries. 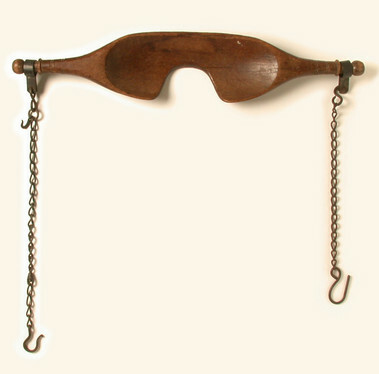 The yoke was made from a beam of wood, usually willow for lightness, but ash and sycamore were also used. It is concave at the centre to fit comfortably around the shoulders, with a recess to fit around the neck of the wearer. The ends of the yoke tapered to terminate just beyond the wearer's shoulders. Chains were then hung from the ends with hooks to fix onto the buckets. When filled, the buckets were very heavy. The milk sellers were usually women. They carried weights of 55kgs. Milk supply and delivery differed in rural and urban areas before the 20th century. Before the coming of the railways, city dwellers had to rely on milk from cows intensively farmed in urban cow yards. London was particularly known for its dairies in residential areas of the city. Cows were kept in cow yards and sheds, where they were also milked. There was not very much space for grazing so cows were fed on manufactured cattle feed such as linseed cake. These herds were known as 'flying herds' because, as soon as the milk yield lessened, they were sent back to the farmer or slaughtered. This type of intensive farming was thought to produce milk of inferior quality to country milk and was thought to be a factor in the spread of tuberculosis in the 19th century. Because of this, Victorian nannies preferred goats' milk for their babies as it was free of tuberculosis. Changes in the transport system, with the development of the railways in the 19th century and cars in the 20th century, led to changes in the milk industry. Milk was collected from farms in the country and taken to the milk train, which would leave the station very early in the morning in order to deliver the milk in time for breakfast in the city. The milk had to be absolutely fresh and the cows had to be milked on the same day of delivery just a few hours before the train left. This meant a very early start for dairy farmers. Milk did not begin to be bottled until after World War I in this country and, as late as the 1930s, the milkman could still be seen delivering the milk by horse and cart fresh from the farm. Some customers would leave small billycans outside their doors and, as now, say how much milk they wanted and the milkman would measure it from his churn into the can. Today milk is collected from dairy farms in huge refrigerated road tankers that carry up to 20,000 litres of milk. It is taken to factories to be processed for drinking and to be made into products like butter, cheese, yoghurt and ice-cream.